All methods of cooking have some affect on the amount of nutrients in food. Induction cooking uses electromagnetism generated by sophisticated electronics to heat the cooking vessel, which then cooks the food. Induction works only on cooking materials made of magnetic material such as cast iron and stainless steel. The energy heats the pots, not the food. Induction effects on food nutrients can be compared to cooking in a standard oven. As of 2010, no specific studies on induction cooking and nutritional values had been carried out. Baking, boiling or frying foods using an induction stove reduces the nutrient content of foods. The specific amount of nutrient loss depends on the cooking method and the particular vitamin or mineral. Nutrient loss can range anywhere from 0 to 75 percent, according to the USDA nutrient retention list. For example, baked fruits retain 80 percent thiamin, 95 percent riboflavin, 90 percent niacin, 95 percent B-6, 60 percent folic acid, potassium and 85 percent of beta carotene, alpha carotene, lycopene and lutein, and retain 100 percent of iron, magnesium, phosphorus and ethyl alcohol, according to the USDA. 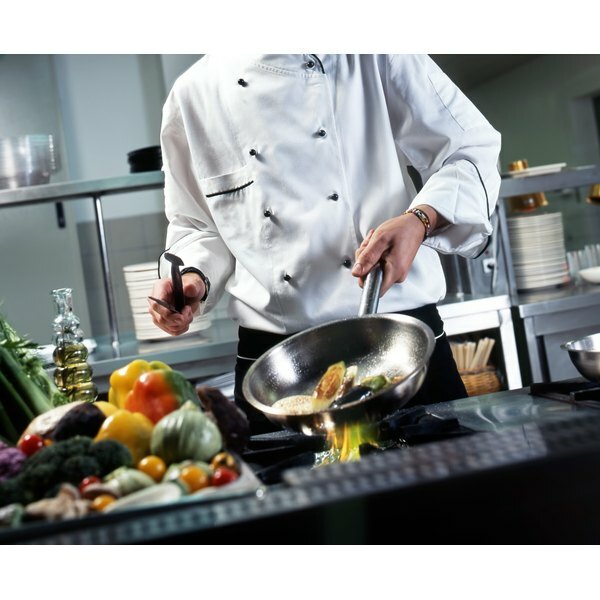 Minerals loss for vegetables in induction cooking is less than with vitamins. Minerals are lost in some induction cooking methods, but are not as affected by cooking method as vitamins. Sautéed foods lost an average of 10 percent of potassium and copper, but retained 100 percent zinc. Other cooking methods such as baking vegetables retained 100 percent zinc, iron copper, magnesium, phosphorus and potassium, according to the USDA. Boiling and stir-frying vegetables on an induction cook stove have the biggest effect on vitamin loss, with losses up to 38 percent of vitamin C, according to a study led by Yuan Gao-feng published in the 2009 “Journal of Zhejiang University SCIENCE B.” Boiled sweet potatoes retained 75 percent folate, vitamin C, 85 percent beta and alpha carotene, lycopene, lutein, vitamin A and 95 percent riboflavin, niacin, B-6, calcium, iron, magnesium, phosphorus, sodium and copper. Meats suffer the most nutrient loss in induction cooking. Thiamine is the most susceptible to degradation and leaching from meat from thermal damage, according to a study led by S. Severi published in the 1997 “European Journal of Cancer Prevention." Simmered pork chops retained 80 percent calcium, 100 percent iron, zinc, copper, 65 percent magnesium, phosphorus, 70 percent sodium and 75 percent potassium. Beef roasted retained 50 percent B-6, 55 percent thiamin, 75 percent niacin, vitamin A, alpha and beta carotene, lutein, 80 percent vitamin C, 85 percent phosphorus, magnesium, sodium, 90 percent calcium, 95 percent folate and 100 percent calcium, copper and zinc. Are Vitamins Destroyed During Cooking?